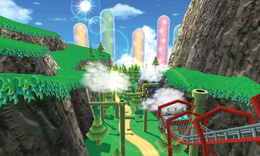 Rock Rock Mountain (known as Alpine Pass in the British English version) is the fourth and final race course in the Flower Cup of Mario Kart 7. It takes place on a mountain with pipes and a forest. The first part of the track takes place on a mountainous cliff with steep drops on the left side, and in a cave with Swoops. The second part of the track takes place in a mountainous forest, with huge gliding sections aplenty. The final section of the track takes place on a mountainside with boulders falling down serving as obstacles. There are many boost panels in this section that lie in the boulders' path. The track starts on a curvy cliff road on the side of a mountain. The road leads to a cave in the mountain with Swoopers flying and colomns blocking the way. After exiting the cave there is a sharp downhill bridge into a glider ramp. The ramp opens up the glider, and there are pipes that must be dodged while gliding down into a valley. One of the pipes blows air in the second lap. Racers land in the forest, driving through trees and felled trunks before hitting a second, but smaller, gliding section. The road then turns to the right, and into a steep uphill climb up the mountain past falling boulders and boost pads. At the top of the mountain is a glider ramp, leading in to the finish line. After the second glider it is possible to cut through the grass only with one mushroom, and the first turn is cuttable with the Peach Parasol or the Flower Glider, as they can rise higher in the air. On time trials it is also possible to use a mushroom in the air to skip the windy cliffs at the start. When racing online, only one of the pipes blow air on the third lap, and the second coin ring in the air is removed. A part of the music from this track is a remixed version of the title theme from Mach Rider. If the player goes to the right side of the forest after the second glider the player will find a tree without leaves, possibly a manufacturing mistake. There are a few more trees without leaves to the left at the end of the forest. All but one of the trees are shown with leaves on the map. This course, along with Cheep Cheep Lagoon and Shy Guy Bazaar, are playable in the demo versions of the game. This page was last edited on April 15, 2019, at 14:54.